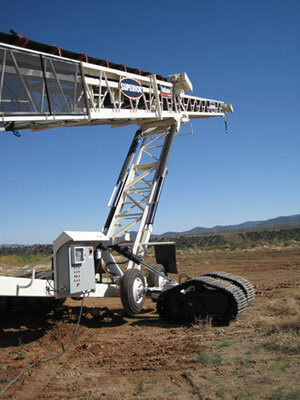 The TeleStacker® Conveyor with a two-wheel mobile pivot base and radial travel tracks delivers free-ranging conveyor movement for increased onsite or transfer point mobility; or for increased flotation and total mobility on low pressure soils – all while reducing the need for haul trucks and loaders, and additional labor and material handling, or other costly loading and unloading systems. The new two wheel mobile pivot base allows high-capacity radial stockpiling in applications that require transfer point mobility. During operation, producers have the option to hydraulically lift the wheels off the ground to lower the feed point of the stacker. Consisting of two 24-inch steel tracks on each side of the conveyor, the radial travel tracks attach directly to the FD axle radial fold-down arms, and are easy to remove for road portability. The system is designed to reuse existing planetary drives and is equipped with hydraulic hoses and fitting connections. The RazerTail® Truck Unloader with a variable-height discharge conveyor is engineered to transfer material from a haul truck and onto a conveyor or another truck – and can be easily relocated to another jobsite in a matter of hours. Requiring only a short, earthen ramp, the RazerTail Truck Unloader reduces the labor and costs associated with conventional truck unloaders. Importantly, the RazerTail Truck Unloader delivers a significant cost-per-ton savings by improving cycle times, minimizing loader use, and eliminating any extra handling of material. Trucks can be through the gate, unloaded and on the road again in minutes; and by minimizing or eliminating loader use, operators realize substantial savings in labor, fuel and maintenance. Its variable-height discharge conveyor allows the unloader to reach higher feed points while eliminating the need for a transfer conveyor between the unloader and stacker conveyor. 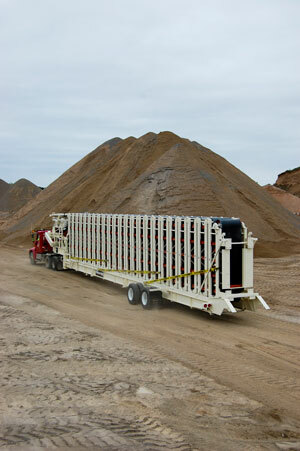 The Trailblazer™ Portable Groundline Conveyor is a new first-of-its-kind overland conveying system. This highly mobile 500-foot, fully-belted and assembled groundline conveyor is easily towable from site to site, allowing rapid deployment from the road to working status in just about an hour. 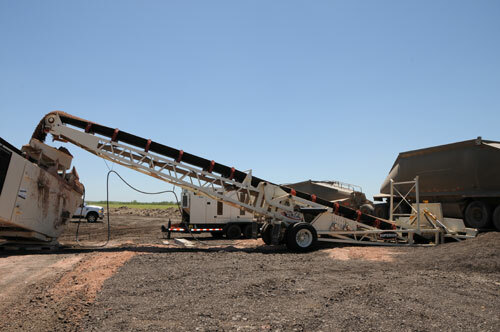 Unlike any other groundline conveying system, which would require days or even weeks for setup or teardown, the new Trailblazer Portable Groundline Conveyor is designed to deliver unprecedented savings in costs and manpower, while also eliminating the downtime associated with the erection of traditional systems – and the need to transport material onsite via costly trucks or loaders. The system’s numerous applications include aggregate, mining, recycle, waste handling, bulk processing, marine material handling and more.